These wedding dresses are stocked at our London Flagship, with a selection available from our international retailers. Bold, glamorous, fearless and seductive are all words that describe the 2018 Charlie Brear Mainline Bridal Collection. 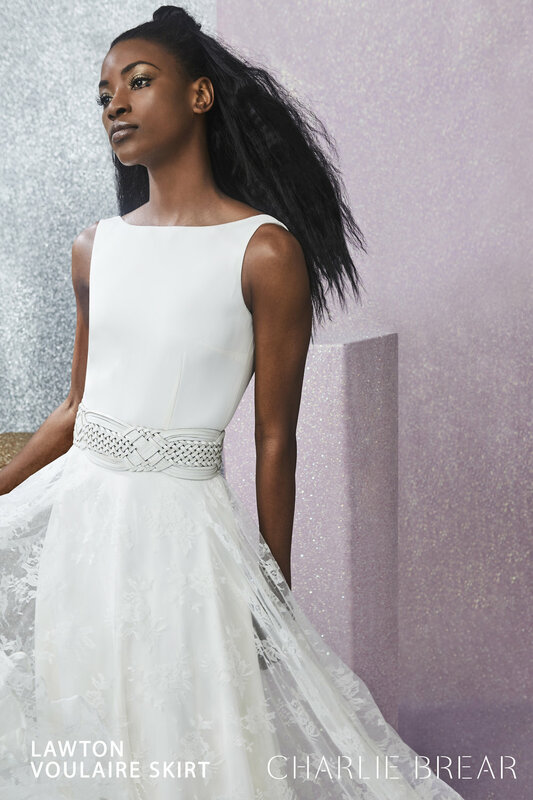 With a subtle nod to 70s Cher and referencing the film Pretty Woman, taking 90s attitude and grit mixed with sophistication, the mood is fun and relevant to this season’s easy-going CB bride. The use of luxe textured fabrics and perfectly cut silhouettes create a light-hearted mood that’s both pretty and aspirational. Cut away necklines, low backs, off-the-shoulder sleeves, front-split skirts and sheer lace panels give the collection its directional, fashion-led feel, whilst uneven pleating, layering, voluminous sleeves and pockets add detail and individuality. The collections focus this season is on stand-alone dresses but stays true to its roots with new hero accessories and separates in the label’s signature range of Additions. CB brides can continue to style their dress for a unique look. Standout pieces of the collection include Avalon, an effortless strapless luxe crepe gown with soft flared bodice overlay and long waist tie; Elua, a tailored dress with graphic dandelion lace sheer sleeves and back panel; and the Keala, a wide-sleeved boxy cropped lace top with optional eyelet lace trim neckline.